What’s the best tinder material when making a fire is essential? The best answer is dry, fibrous material which catches a spark even in wet conditions. Fire starting woes are compounded when the dry stuff isn’t available. Every bushcraft, camping, hiking, or emergency kit should include redundant layers for making fire. A flick from your Bic doesn’t guarantee fire. 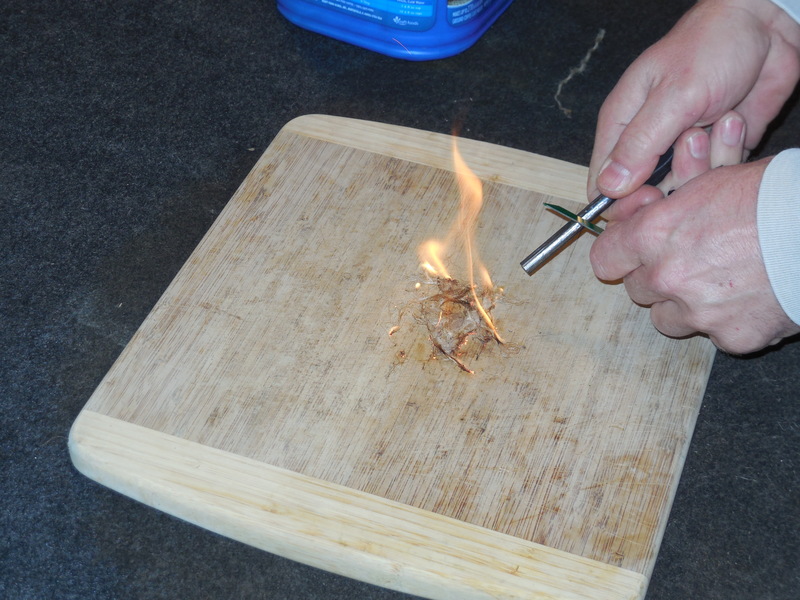 It may produce a flame (depending on conditions) but you’ll need dry tinder in your fire lay to get warm. Preparing a fire kit ahead of time will help you avoid a freezing night or worse. Commercially produced fire starters are available. 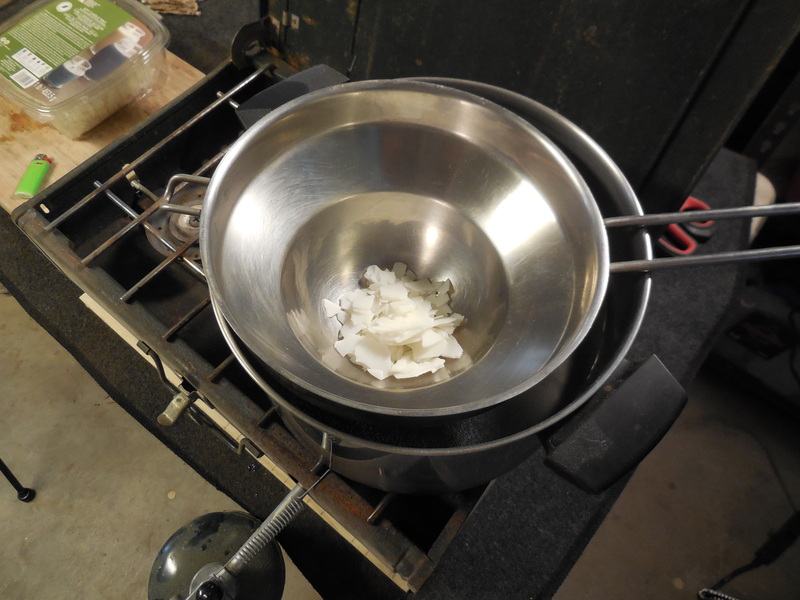 Why pay 8 to 10 bucks for a pack of waterproof fire starter tabs when you can make your own? I’ve been making my own out of jute twine and wax for years. A 500 foot roll of jute twine cost less than $10. Plus, you can never have enough cordage. The same goes for wax. If you don’t have wax on hand, poach a few crayons to melt from your child’s school supplies. Just so you know, peeling paper sleeves is tedious and time-consuming. Save time and buy paraffin wax from the canning isle at your grocery store. I used soy wax I have for candle making. [Skip this step if you’ve ever melted wax in a double boiler] Set up your double boiler with enough water in the bottom container to make the top container float. In my shop, I use an old camp stove. Your kitchen stove will work. 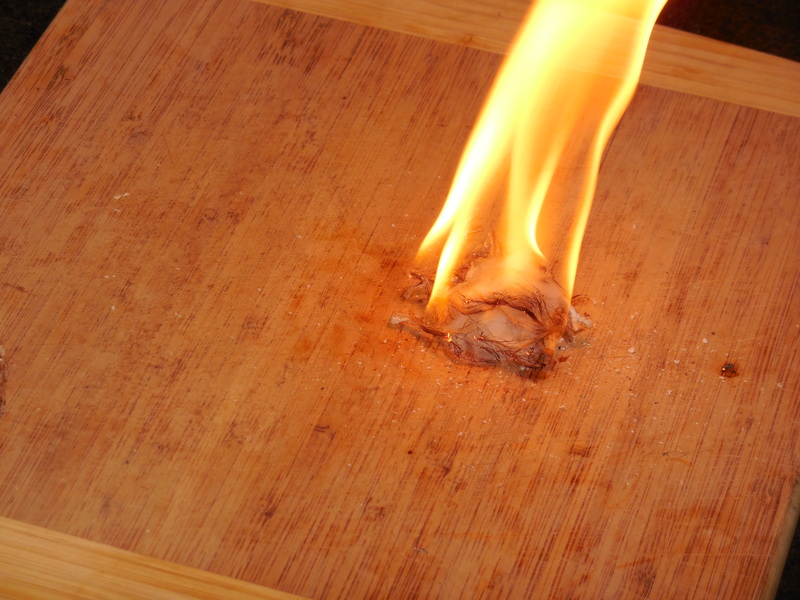 To avoid igniting the wax, don’t use open flames or high heat directly on a pan with wax in the bottom. 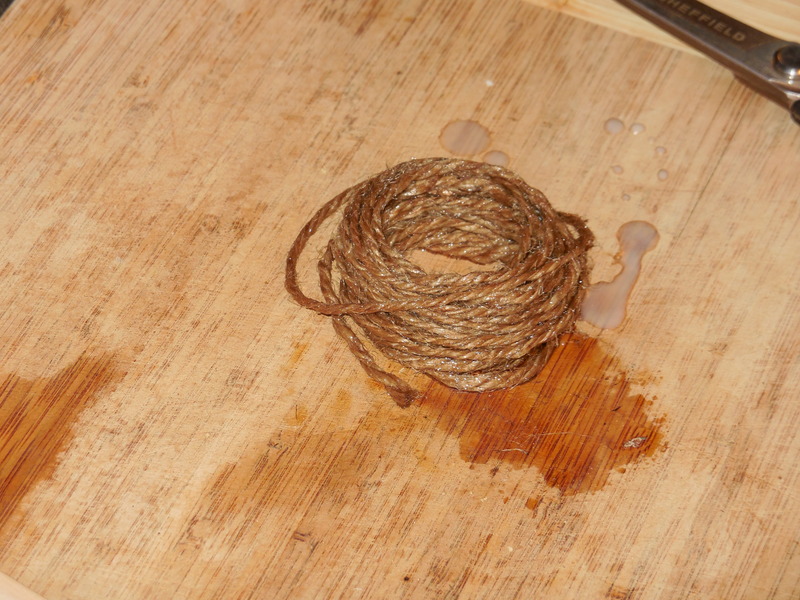 While bringing the water to boil, prep you twine. Measure and cut about 12 feet of jute twine… about 2 arm spans for me. Roll it around 3 of your fingers to make a loose bundle. Place the entire bundle in the melted wax. Flip it over to completely saturate the jute. 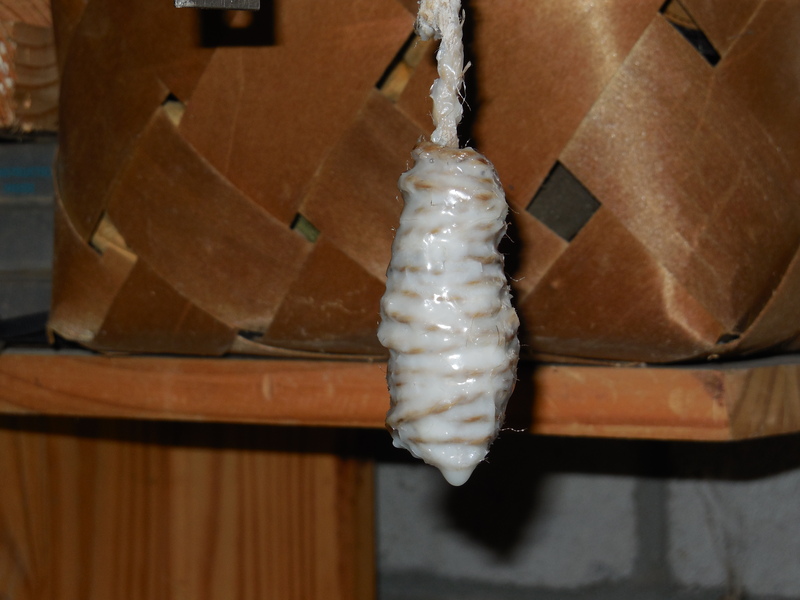 The twine is very absorbent and won’t take long to soak up the liquid wax. Set bundle aside and prepare your drill. Don’t attempt this step unless you have variable speed drill. You don’t really need a drill to make the bundle. You could wind the twine around a nail or metal pin by hand. But it is way more manly to do it with power tools! Place the drill in a vise. Tie one end of the twine to the head end of the pin with a basic slip knot. Do this fairly quickly after removing the bundle from the wax. The longer you wait, the more stiff the waxed twine becomes. 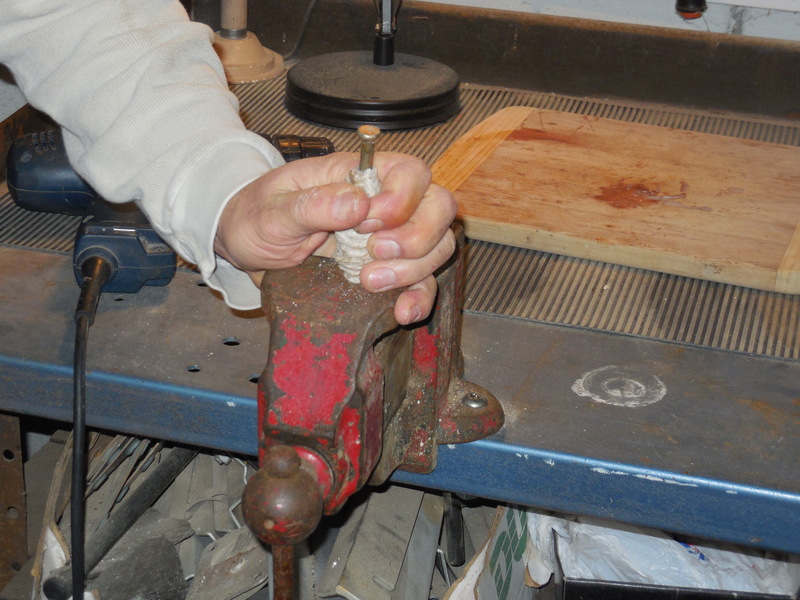 With one hand on the trigger of your drill and one holding the tag end of the twin, slowly squeeze the trigger to begin winding the twine around pin. You’re trying to coil the cord almost to the drill bit opening on your first pass. 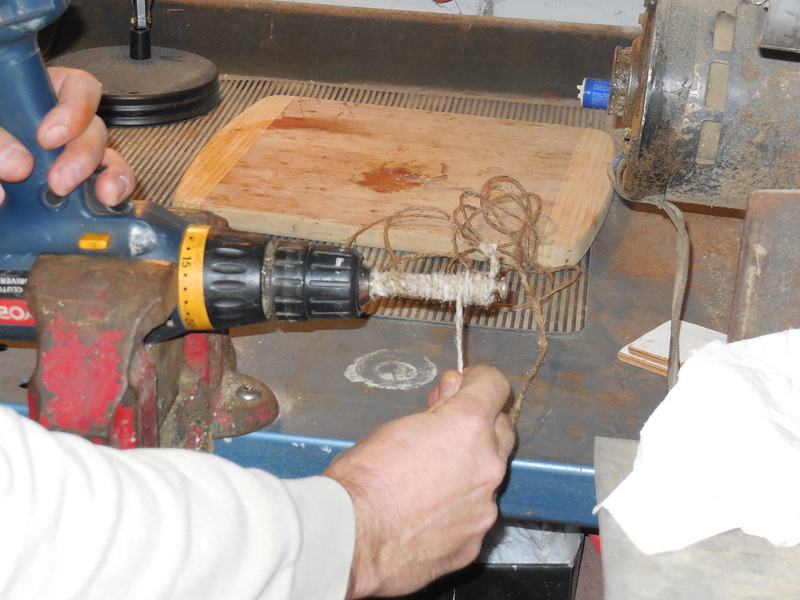 When you reach that point near the drill, guide the twine back towards the other end. I make my bundles oblong – skinny on the ends and fat in the middle. Remove the pin from the drill. Hold the bundle in your hand and press it gently down on a hard surface causing the head end of the pin to emerge from the top of the bundle. Grab the head end and pull. If you used a smooth metal pin, the bundle will slide off with no resistance. Tie the loose tag end at the middle of the bundle leaving a 1 inch tag to hang free. This loose tag end is where you’ll start unrolling pieces from the bundle. While the wax is still liquified, hold the knot end of the bundle and coat with the remaining melted wax on all sides. Hang it from the knot with a clip to dry. Once dry, repeat this step two times. 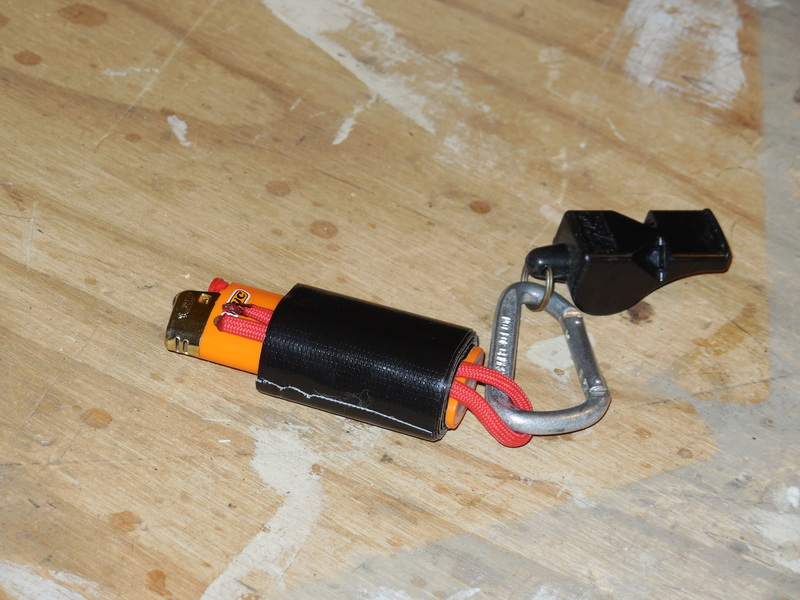 Now, to make your time productive between dipping, create a Paracord-Duct-Tape-Lighter. I know, it’s a bonus DiY Preparedness Project for you. You get 2 for 1 today… No extra charge! Grab the child-safety strip that runs over the striker wheel with a pair of needle-nose pliers. Twist up and out of the lighter housing. Bend the housing back down flat. This step makes it easier to get flame when your fingers and hands are numb from cold. Cut a piece of paracord a little over double the length of the lighter. Burn the ends to prevent fraying. 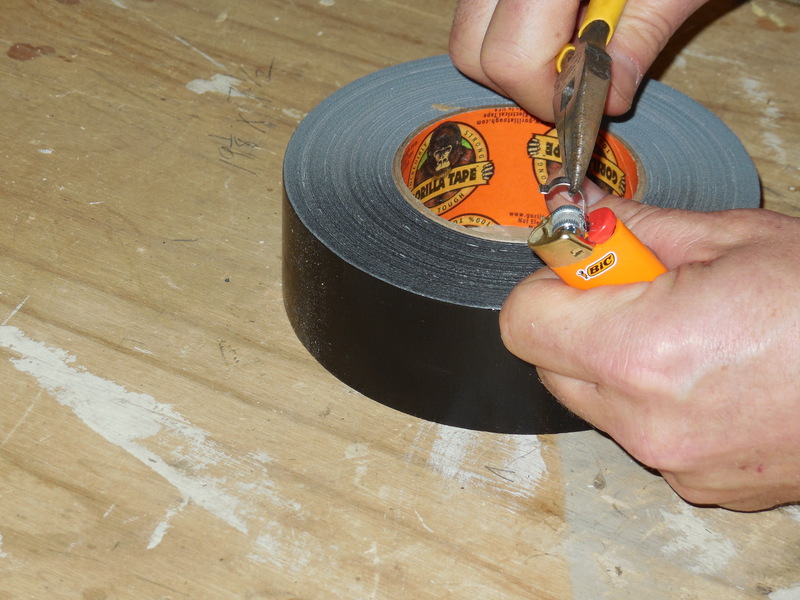 Make several wraps of duct tape (Gorilla Tape) around the lighter. 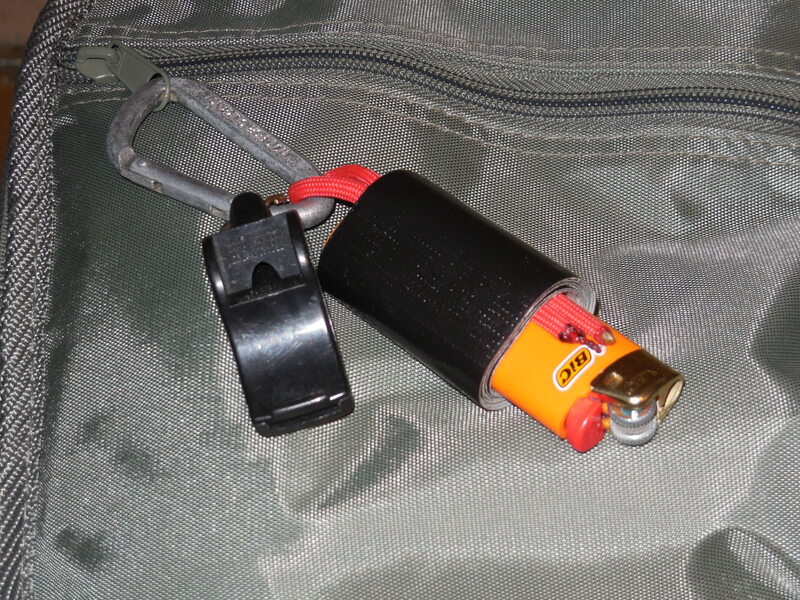 Add a whistle or other useful emergency items and attach it to your kit. No more fumbling around for fire when you need it! 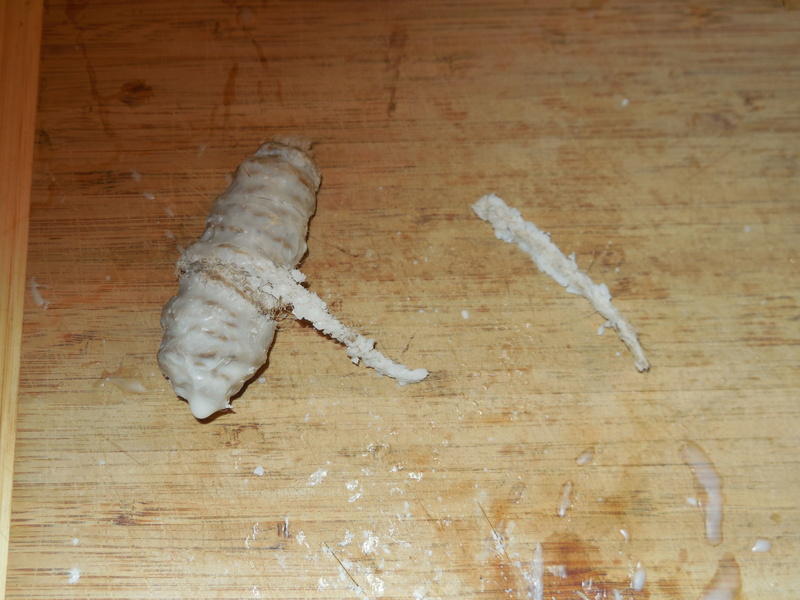 Your bundle will resemble a honeycomb with three layers of wax. To use, find the short tag end at the middle of the bundle from Step 4. Untie and roll off a 2 inch section. The wax will crumble but won’t affect the waterproofing. No worries, the whole bundle is waxed. Process the piece by pulling and fraying the individual strands to create a fibrous, hairy looking nest. This only takes a few minutes. Time well spent if using a ferro rod or other sparking device. 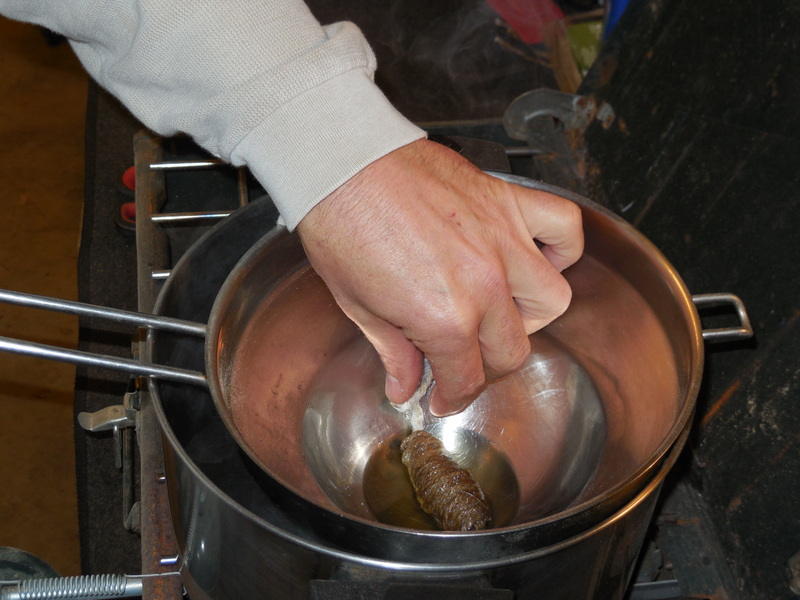 Of course, if you’re lighter works, you can simply light the cord and make hot chocolate. Below is a comparison of waxed and non-waxed jute. They both ignite immediately by a ferro rod but the waxed version will extend your fire. You need all the advantages you can get when building fire. Non-waxed fibers burned in less than 15 seconds… like flash powder. Build it… and it will burn! Great idea, Todd!! Learning more and more from you!! Ah, thanks Patrick! Glad it was helpful. Even if you don’t want to wax the twine, jute makes a great tinder material. Just keep it dry. It’s cold, and I like warm. I make our fire starters from toilet paper tubes. Cut the tube in half, stuff 1/2 full with dryer lint or the paper that was wrapped around the roll, stand them all up on a sheet of foil, spoon in the wax, and finish stuffing. Takes about 30 minutes to make 50 or more of these little lovelies. We use them in our wood stove. I don’t have a double boiler so I stick the wax (usually old candle stubs) in a empty veggie can in a pot of water. Works fine. I’ve heard those work well. Never tried them. I made my jute twine fire starters mostly for outdoor, bushcraft type fires. Glad you shared your method! Very resourceful on the double boiler! Would bailers twine work here as long as its the natural stuff? Natural fibers will work. Synthetic stuff just melts. Let us know how it works out. Great tips! 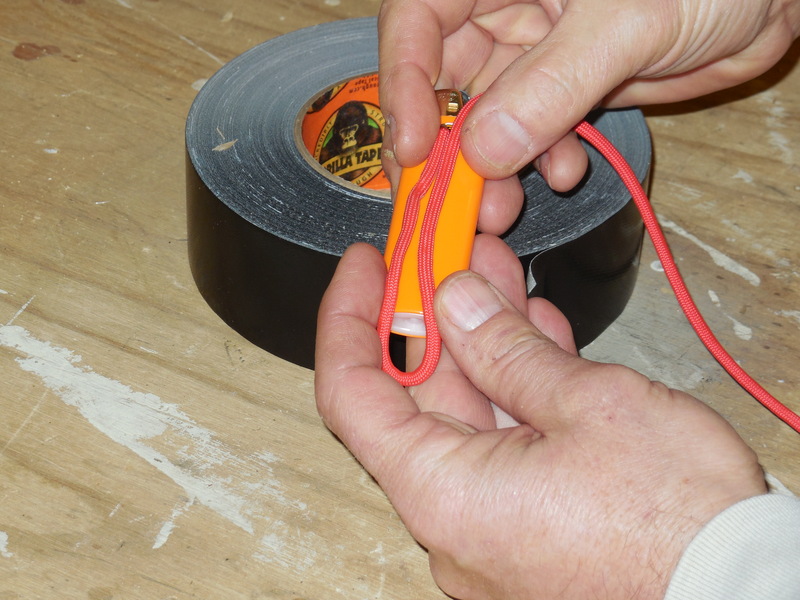 Hey, while covering your lighter with duct tape, why not go around a whole bunch of times so you not only hold your para-cord in place but have also created a travel roll of duct tape just in case you need some. Good idea, Julie. I keep a roll of Gorilla tape in my bags too. Can’t have enough DT! Vaseline coated cotton balls is all you need. Its fast, easy, inexpensive and no tools required. The vaseline repels water but is probably not water proof. I guess it depends on how much you use. I put a glob vaseline in my hand then place the (real) cotton ball in my hand and manipulate it like your making a snow ball or meat ball. Remove any globs of vaseline and do the next one. These vas-cotton balls will burn for about 2 minutes and will light on the first spark of the fire steel if you fluff the cotton ball before striking. Vaseline is a petroleum distillate, water will bead right off. Another tip adding to your cotton ball is chap stick. It works on the same principle. The real reason I am commenting is if you know anyone that chews Copenhagen, pack the empty can with cotton balls and Vaseline. If it is super wet out, remove the tin lid and light the whole thing. Should last 10 or more minutes if done right. Also old prescription bottles are a good way to store cotton balls and Vaseline. Just stuff I have picked up along the way. I had to laugh reading this because I store mine in old snuff tins. The prescription bottle will work also, but keep in mind the coated cotton balls tend to stick together and prying them out of a tube type container can be difficult. The snuff tin allows you to pull one out much easier. I use the ninja stars I keep in by “72 hour cross country BOB/TEOTWAWKI/GHB/Walmart-Sack”, I figure with my ninja skills I learned from years of playing mortal kombat I can spark them together off the ninja sword I got down at phil’s pawn, you know for zombie killing. I can just burn those old zombie clothes with the sparks for heat…. Seriously though, excellent fire starter concept, I’ll have to try this out next time the kiddo and I are practicing firestarting in the back. Thanks for the info! I’ll let you know how it went! LOL! What a hoot. Those ninja stars are the bomb! And do keep us posted, faulkners. Thank you for the support, Wayne!